Thedigital space has witnessed major transformations in the last couple of years & the latest entrant to the digital space is the Internet of Things(IoT). Recent trends such as the rise of the fourth industrial revolution, Industry 4.0, and the convergence of the digital and physical worlds - including information technology (IT) and operations technology(OT) - have made the transformation of the supply chain increasingly possible. At the same time, the demands of these dig ital supply chain network soars high. Having understood this matured market, Bangalore based MatrIoT has been building solutions and products focused on the digital supply chain segment. MatrIoT Solutions is an Internet of Things(IoT) and automation company providing end-to-end solutions for enterprises using the combination of hardware and software through its robust M3 (MatrIoT’s Machine to Machine) Platform. 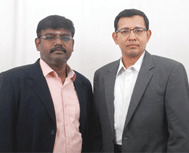 The company was founded by highly experienced team of Ramji Rengarajan, Satheesh Babu Muthupandi and Ramesh Kumar Ponnusamy. that address the digital supply chain demands like cost savings, better operational efficiencies & decision making and increased supply chain visibility. “Smart Factory and Smart Warehouse vision doesn’t get fulfilled for enterprise if its assembly line, asset and inventory management are not automated; when it is handling material through IoT, our cutting edge technology & expert methodology makes this vision possible”, says Ramji Rengarajan, Co-founder & Director, MatrIoT Solutions. "MatrIoT solutions enable automated robust notifi cations and alert to be sent to relevant stakeholders when significant events occur"
cBin (Connected Bin) is an innovative IoT Product powered by M3 Platform is a combination of basic principles of Kanban and modern technology of sensors and smart labellings (RFID tags) of existing bins. cBin monitors the availability of stocks continuously 24*7 and the real-time consumption patterns. Moreover, this lean manufacturing solution automatically detects the restock levels and provide a real-time alerting mechanism for bin replenishments and thereby elimting and last minute orders and Out of Stock situations. Taking care of the asset movements, MatrIoT puts forth their asset tracking solution called AssetTracker. The solution supports RFID, Wifi & BLE based asset tracking solutions enabling to locate assets real-time and providing RTLS (Real-time Locating System). cShelf is a Smart Shelving solution that provides retailers and customers the ability to continuously and remotely monitor merchandise/item availability in real- time at the shelf level of Showroom/ backroom and Warehouse racks. cShelf is strongly supported by MatrIoT's RFID readers, slim, elegant and thin UHF RFID antenna with unique radiation pattern and associated accessories. MatrIoT solution enables automated robust notifications and alert to be sent to relevant stakeholders when significant events occur; events like out of stock, replenishment alerts, asset being moved out within specific range of location, or not being used for a specific period etc. the differentiation lies in analytical engine’s ability to triangulate the demand peak and inventory availability. Recognized by Startup India and Startup Karnataka, MatrIoT is currently incubated in NASSCOM IoT CoE and has made quite the stardom in the IIoT segment. MatrIoT stronly believes that the fundamental shift happens over 5 years in terms of adoption of real-time automated assembly line and smart shelving across industries. MatrIoT is destined to becoming one of the top IIoT players in the Indian market with strong global aspiration.